Observing the activities of decision makers is just one way to assess their information requirements. Observing the physical environment where decision makers work also reveals much about their human information requirements. Most often, such observing means systematically examining the offices of decision makers, because offices constitute their primary workplace. Decision makers influence and are in turn influenced by their physical environments and by their interactions with the technology that takes place there. Many HCI concerns can be identified through structured observation and confirmed with other techniques, such as interviews or questionnaires. Film critics sometimes use a structured form of criticism called mise-en-scène analysis to systematically assess what is in a single shot of the film. They look at editing, camera angle, set decor, and the actors and their costumes to find out how they are shaping the meaning of the film as intended by the director. Sometimes the film’s mise-en-scène will contradict what is said in the dialogue. For information requirements analysis, the systems analyst can take on a role similar to that of the film critic. It often is possible to observe the particulars of the surroundings that will confirm or negate the organizational narrative (also called “stories” or “dialogue”) that is found through interviews or questionnaires. The method for STRuctured OBservation of the Environment is referred to as STROBE. 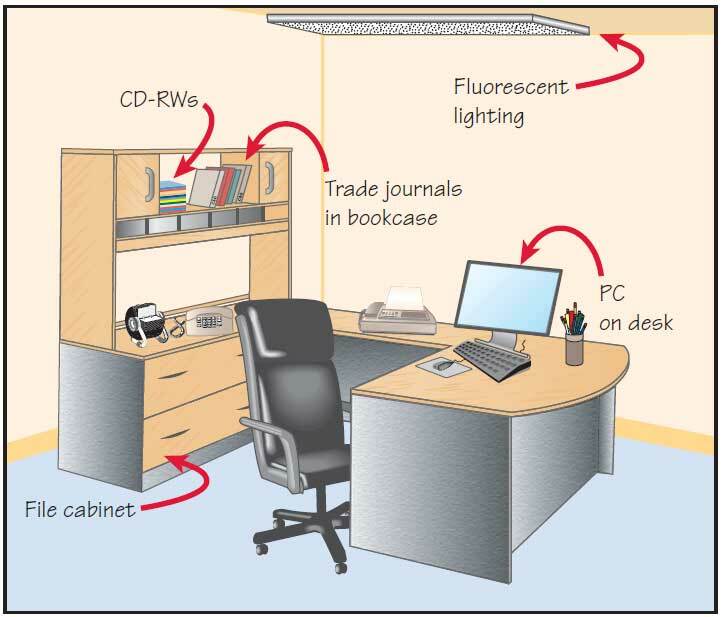 Successful application of STROBE requires that an analyst explicitly observe seven concrete elements commonly found in offices. The seven observable elements and some key questions that may arise are listed in the table shown below. These elements can reveal much about the way a decision maker gathers, processes, stores, and shares information, as well as about the decision maker’s credibility in the workplace. Office location Who has the corner office? Are the key decision makers dispersed over separate floors? Desk placement Does the placement of the desk encourage communication? Does the placement demonstrate power? Stationary equipment Does the decision maker prefer to gather and store information personally? Is the storage area large or small? Props Is there evidence that the decision maker uses a PC, smartphone, or tablet computer in the office? External information sources Does the decision maker get much information from external sources such as trade journals or the Web? Office lighting and color Is the lighting set up to do detailed work or more appropriate for casual communication? Are the colors warm and inviting? Clothing worn by decision makers Does the decision maker show authority by wearing conservative suits? Are employees required to wear uniforms? OFFICE LOCATION. One of the first elements a systems analyst should observe is the location of a particular decision maker’s office with respect to other offices. Accessible offices tend to increase interaction frequency and informal messages, whereas inaccessible offices tend to decrease the interaction frequency and increase task-oriented messages. Offices distributed along the perimeter of the building usually result in a report or memo being held up in one of the offices, whereas office clusters encourage information sharing. It is also likely that the people whose offices are separated from others may tend to view the organization differently and so drift further apart from other organization members in their objectives. DESK PLACEMENT. Placement of a desk in the office can provide clues to the exercise of power by the decision maker. Executives who enclose a visitor in a tight space with the visitor’s back to the wall while allowing themselves a lot of room put themselves into the strongest possible power position. An executive who positions his or her desk facing the wall with a chair at the side for a visitor is probably encouraging participation and equal exchanges. The systems analyst should notice the arrangement of the office furniture and in particular the placement of the desk. 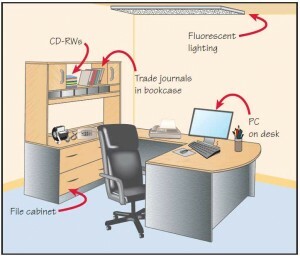 Figure illustrated below shows an example of desk placement as well as many of the other elements of STROBE, such as props, stationary office equipment, lighting, color, and external sources of information. Observe a decision maker’s office for clues concerning his or her personal storage, processing, and sharing of information. STATIONARY OFFICE EQUIPMENT. File cabinets, bookshelves, and other large equipment for storing items are all included in the category of stationary office equipment. If there is no such equipment, it is likely the decision maker stores very few items of information personally. If there is an abundance of such equipment, it is presumed the decision maker stores and values much information. PROPS. The term props (an abbreviation of the theatre/film term properties) refers to all the small equipment used to process information, including smartphones, calculators, PCs, pens, pencils, and rulers. The presence of handhelds, calculators, and PCs suggests that a decision maker who possesses such equipment is more likely to use it personally than one who must leave the room to use it. EXTERNAL INFORMATION SOURCES. A systems analyst needs to know what type of information is used by the decision maker. Observation of the type of publications stored in the office can reveal whether the decision maker is looking for external information (found in trade journals, news items about other companies in the industry, and so on) or relies more on internal information (company reports, intraoffice correspondence, policy handbooks). The analyst should also observe whether the decision maker prefers to get external information from the Web. OFFICE LIGHTING AND COLOR. Lighting and color play an important role in how a decision maker gathers information. An office lighted with warm, incandescent lighting indicates a tendency toward more personal communication. An executive in a warmly lit office will gather more information informally, whereas another organizational member working in a brightly lit, brightly colored office may gather information through more formal memos and official reports. CLOTHING WORN BY DECISION MAKERS. Much has been written about the clothing worn by executives and others in authority. The systems analyst can gain an understanding of the credibility exhibited by managers in the organization by observing the clothing they wear on the job. The two-piece suit for a man or the skirted suit for a woman represents the maximum authority, according to some researchers who have studied perceptions of executive appearance. Casual dressing by leaders tends to open the door for more participative decision making, but such attire often results in some loss of credibility in the organization if the predominant culture values traditional, conservative clothing. Through the use of STROBE, the systems analyst can gain a better understanding of how managers gather, process, store, and use information. A summary of the characteristics exhibited by decision makers and the corresponding observable elements is shown in the table illustrated below. 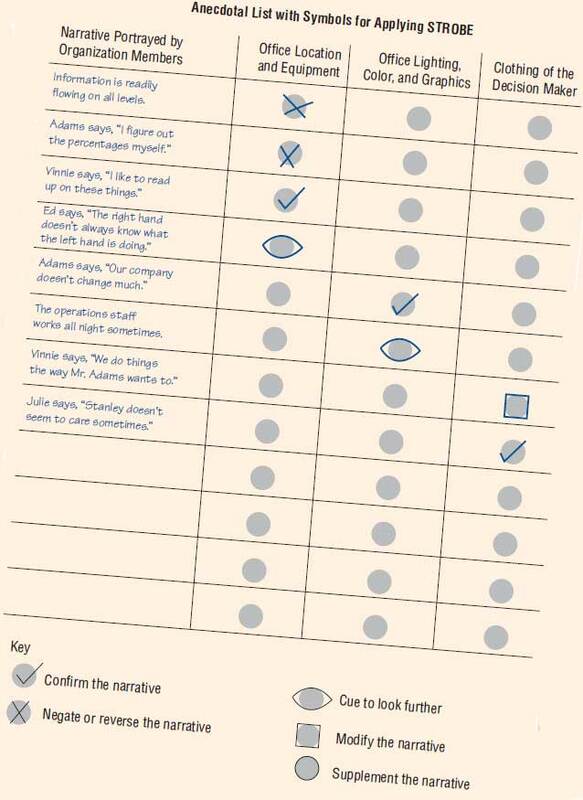 One way to implement STROBE is through the use of an anecdotal checklist with meaningful shorthand symbols. This approach to STROBE was useful in ascertaining the information requirements for four key decision makers in a franchise clothing store. 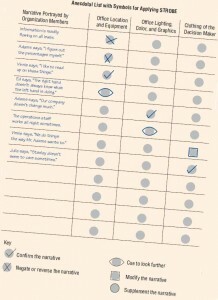 A check mark means the narrative is confirmed. An “X” means the narrative is reversed. An oval or eye-shaped symbol serves as a cue for the systems analyst to look further. A square means observation of the STROBE elements modifies the narrative. A circle means the narrative is supplemented by what is observed. An anecdotal list with symbols for use in applying STROBE. When STROBE is implemented in this manner, the first step is to write down key organizational themes growing out of interviews. Then the elements of STROBE are observed and recorded. When narrative and observations are then compared, one of the five appropriate symbols is used to characterize the relationship. The analyst thus creates a table that first documents and then aids in the analysis of observations.